GSMArena team, 21 July 2015. Many thought the days of BlackBerry were numbered yet the company is still here, pushing new phones. The Canadians might not be the leading smartphone manufacturer that it once was, but it's still got a loyal fanbase that the BlackBerry Leap comes to cater to. You get a 5" HD display, dual-core processor, 2GB RAM, an 8MP shooter and a rich connectivity package - not the kind of specs to make a geek's pulse race, but adequate for the mid-range that the Leap is targeting. The design is instantly recognizable - square edges, plastic unibody and dotted rear panel with a huge BlackBerry logo. It's more of the classic kind, rather than modern or fresh, but that's a good thing to say for a business-oriented phone. 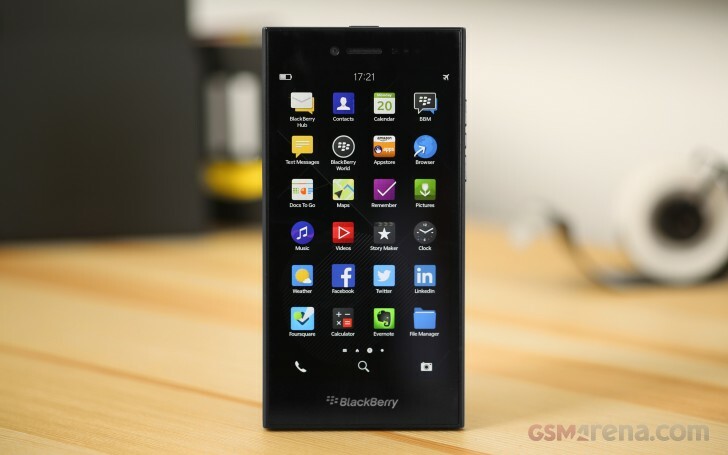 The BlackBerry Leap is hardly a hero device set to lift the profile of the company - instead it's a workhorse that should bring in some extra sales and help keep the maker afloat until it figures out its next strategic move. And on paper it looks capable of handling the task. Of course we shouldn't forget that competition in the mid-range has never been this fierce. What was once a land of underperforming handsets trying to replicate flagships designs with cheaper materials and often failing spectacularly now hosts a bunch of very solid smartphones that can cater to the needs of many a power user. The Leap needs to convince us it's got what it takes to compete there, offering enough standout features to attract attention and a well-balanced experience to make customers reach for their wallets. Let's see how this one goes - we start with the unboxing and hardware inspection after the break.